Camillo's Cafe is hosting an "Evening of Fun & Romance" tomorrow night at 6:00 pm. There will be live jazz and a menu of grilled specialties. 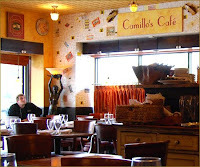 Camillo's Cafe is located at 301 North Harrison Street in Princeton Shopping Center. Call 609-252-0608 for a reservation.